Under General Director Speight Jenkins’ 30 years of leadership, Seattle Opera has become known as “America’s Bayreuth,” drawing worldwide audiences to its acclaimed productions of all of Richard Wagner’s major works, especially to the company’s signature work, Wagner’s ambitious four-opera cycle, Der Ring des Nibelungen. To date, opera-goers from 22 countries and all 50 states (plus the District of Columbia) have purchased tickets for Seattle Opera’s 2013 Ring. As performances of the Ring get underway on August 4, a wide variety of new and cherished education programs will enthrall and delight diehard Wagnerites and newcomers alike. Hosted in the Nesholm Family Lecture Hall at McCaw Hall, Seattle Opera’s three signature Symposia bring together artists, scholars, and authors to explore the complexities of Wagner and the Ring. Asher Fisch, Seattle Opera’s Principal Guest Conductor and conductor of the 2013 Ring, speaks at all three Symposia; other presenters include Lydia Goehr, Roger Parker, Kenneth Reinhard, Stephen Wadsworth, Michael Hackett, Mark Berry, François Rochaix, Pamela Rosenberg, Arthur Groos, and Peter Kazaras. Sue Elliott gives her Inside the Ring presentations the morning of each performance day. Immediately before each performance, patrons can attend the entertaining, hour-long Pre-Performance Talks given by Community Programs Manager Robert McClung. And all patrons are welcome to join the discussion at the free Q&A with Speight Jenkins after each performance of Die Walküre, Siegfried, and Götterdämmerung. Following performances of Das Rheingold, Speight Jenkins will host Rheingold Revelry,an exclusive champagne reception and late supper open to all Ring full-cycle buyers. Other Ring-related opportunities include investigating technical solutions to the top 10 “problems” in producing any Ring cycle at the Tech Talks with Robert Schaub, the company’s Technical and Facilities Director; a night of new comedy, Wagner Sketches,at Seattle Repertory Theatre once each cycle; and a 2013 special: Speight’s Retrospective, a personal exploration of life with the Ring. And BRAVO! Club’s popular Laser Ring returns to the Pacific Science Center’s Laser Dome for one night only on August 11! Seattle Opera’s 2013 Ring is conducted by Principal Guest Conductor Asher Fisch. 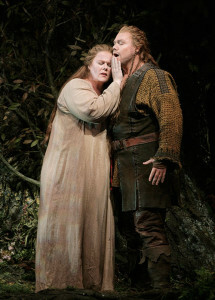 The production features the Seattle Opera debuts of British soprano Alwyn Mellor as Brünnhilde and German tenor Stefan Vinke as Siegfried. 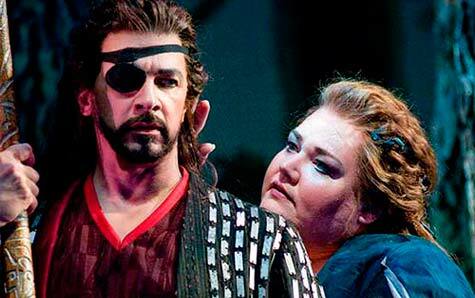 Bass-baritone Greer Grimsley returns as Wotan, the role for which he won the Seattle Opera Artist of the Year Award in 2005. Also returning are baritone Richard Paul Fink as Alberich, soprano Margaret Jane Wray as Sieglinde and the Third Norn, tenor Stuart Skelton as Siegmund, and mezzo soprano Stephanie Blythe as Fricka, the Second Norn, and Waltraute (Götterdämmerung). Stephen Wadsworth returns to direct this beloved “Green” Ring production, with sets designed by Thomas Lynch, costumes by Martin Pakledinaz, and lighting by Peter Kaczorowski.